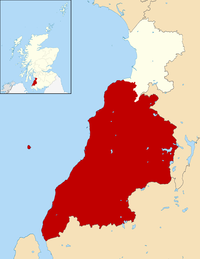 Maybole (Scottish Gaelic: Am Magh Baoghail, pronounced [ə maɣ ˈpɯː.al]) is a burgh of barony and police burgh of South Ayrshire, Scotland. Pop. (2011) 4,760. It is situated 9 miles (14 km) south of Ayr and 50 miles (80 km) southwest of Glasgow by the Glasgow and South Western Railway. Maybole has Middle Ages roots, receiving a charter from Donnchadh, Earl of Carrick in 1193. In 1516 it was made a burgh of regality, although for generations it remained under the suzerainty of the Kennedys, afterwards Earls of Cassillis and (later) Marquesses of Ailsa, the most powerful family in Ayrshire. The Marquess of Ailsa lived at Cassillis House, just outside Maybole until its sale in 2007. In the late seventeenth century, a census recorded Maybole was home to 28 "lords and landowners with estates in Carrick and beyond." In former times, Maybole was the capital of the district of Carrick, Scotland, and for long its characteristic feature was the family mansions of the barons of Carrick. Maybole Castle, a former seat of the Earls of Cassillis, dates to 1560 and still remains, although aspects of the castle are viewed as "of concern". The public buildings include the town-hall, the Ashgrove and the Lumsden fresh-air fortnightly homes, and the Maybole combination poorhouse. Maybole is a short distance from the birthplace of Robert Burns, the Scots national poet. Burns' mother was a Maybole resident, Agnes Brown. In the nineteenth century, Maybole became a centre of boots and shoe manufacturing. Margaret McMurray (? ?-1760), one of the last native speakers of a Lowland dialect of Scottish Gaelic, is recorded to have lived at Cultezron (not to be confused with nearby Culzean), a farm on the outskirts of Maybole. Maybole has a number of landmarks, reflecting its role as a settlement on the southwest Scottish coastline, 43 miles south of the commercial and shipbuilding concentrations on the River Clyde and Glasgow, and 92 miles north of Carlisle, the most north-westerly English city. The ancestral seat of the Marquesses of Ailsa is Culzean Castle, now run by The National Trust for Scotland and located four miles west from Maybole. This dates from 1777; it stands on a basaltic cliff, beneath which are the Coves of Culzean, once the retreat of outlaws and a resort of the fairies. A primary rail service is at Maybole railway station. Set up in 1860. Two miles to the south-west are the ruins of Crossraguel (from Crois Riaghail meaning 'Cross of St Regulus' ) Abbey, founded about 1240. In the early 20th century, Maybole added a Baptist church. This was admitted to the Baptist Union in 1901 and appointed its first full minister in 1919, a year after the Great War finished. Kirkoswald, where Robert Burns spent his seventeenth year, learning land-surveying, lies a little farther west. In the parish churchyard lie the real people who inspired two of Burn's fictitious characters Douglas Graham (Tam o' Shanter) and John Davidson (Souter Johnnie). Farther south are the ruins of Turnberry Castle, where Robert the Bruce is said to have been born. A few miles to the north of Culzean are the ruins of Dunure Castle, an ancient stronghold of the Kennedys. The head of the old Maybole Cross in the gardens of Maybole Castle. The cross bears the coats of arms of the Kennedy family of Cassillis and has a rare Moon dial on one face. The town has three primary schools: Cairn Primary, Gardenrose Primary and St Cuthberts Primary. The secondary school for Maybole is Carrick Academy. Carrick Academy is also a School of Rugby due to its many successes in the sport. The lyrics of The Waterboys' "Glastonbury Song" include: "I dreamed myself from the sultry plains, To the old green square back in old Maybole ..."
Sir Gilbert Blane (1749–1834), 18th–century physician and Royal Navy reformer. John Loudon McAdam (1756–1836), Scottish engineer and roadbuilder of the eighteenth century. Rev Dr William King Tweedie (1803–1863), Scottish historian, biographer and minister of the Free Church of Scotland. Thomas Ramsay (1857–1934), first pastor of Maybole Baptist Church, 1901–19, and President of the Baptist Union of Scotland, 1921–22. Rev R Guy Ramsay (1895–1976), Scottish Baptist minister and President of the Baptist Union of Scotland, 1948–49. Norris McWhirter (1925–2004), founder of the Guinness Book of World Records, is descended from the McWhirters of Maybole. ^ "Area Profiles". Scotland's Census 2011. Retrieved 19 April 2015. This article incorporates text from a publication now in the public domain: Chisholm, Hugh, ed. (1911). "Maybole" . Encyclopædia Britannica. 17 (11th ed.). Cambridge University Press. p. 931. Wikimedia Commons has media related to Maybole. This page was last edited on 18 April 2019, at 08:57 (UTC).